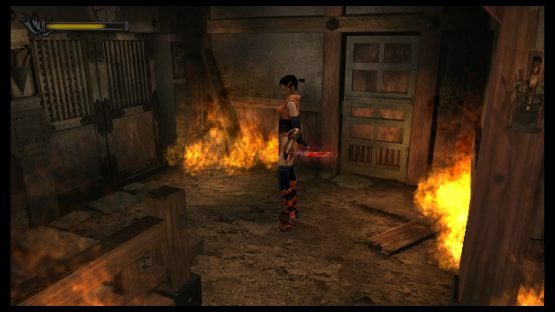 Onimusha: Warlords is an old game, and not much of it changes in the remaster. But it’s also a game that maybe not a lot of you have played in the past 18 years. There are plenty of things that are not very obvious to know or think about that are worth pointing out to you before you get ankle deep in samurai demons. Hopefully this little list of beginner’s tips can keep you straight as an arrow from the Great Bow. Look, this seems like a no-brainer, but hear me out. Games these days are so autosave heavy that you take being able to return where you left off for granted. This game was made in 2001. Checkpointing wasn’t what it is now. If you die, you will absolutely lose any progress not recorded at a magic mirror. I’m just here to help. 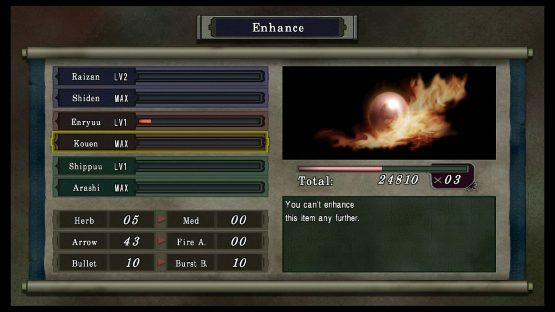 In lockstep with games like Resident Evil, Onimusha’s very clear inspiration, health is a limited resource. There is a finite amount of items hidden throughout the castle and the surrounding grounds. So be very cautious about how much risk you put yourself into when backtracking. The damage you take is far more costly knowing that you can’t just buy more healing. Every once in awhile, you’ll happen upon a very unlucky guard trying his best to fight off some demons. Spoiler Alert: he can’t. 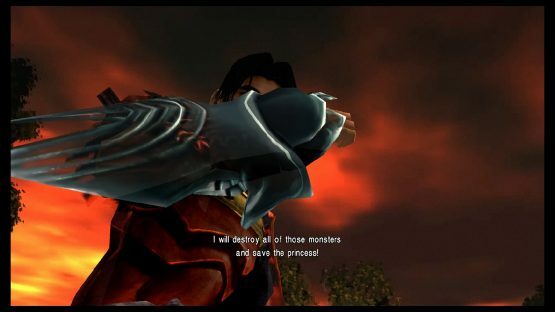 But you can save them by killing the enemies around them before the enemies do their own killing. When they are saved, they’ll drop to their knees in relief, and also drop items that will be very useful for you. 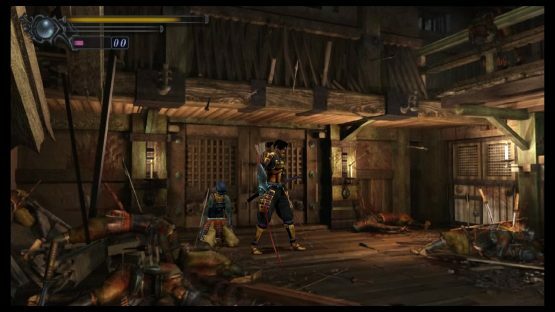 The nuanced combat in Onimusha is largely hidden from you, but with a little experimentation, you’ll find that there are some special moves that you can exploit that’ll help you get the upper hand on tough foes. Kicks will knock over light enemies and stun bigger ones. You can kick enemies two ways. Hit the down arrow and square (the attack button) at the same time, and you’ll throw a quick push kick in whatever direction you’re facing. Alternatively, when locked on to an enemy, hold the movement stick away from the direction you’re facing and attack. Kicking is a great way to knock enemies down. Why is that important? The most obvious reason is that a knocked down enemy can’t attack you. But you can also stand over an enemy and execute them when they are down, making what would be an extended exchange end in a single stroke. You can’t treat every enemy the same way. All enemies can just be hacked at until they die. However, since health is finite, as we mentioned before, this isn’t always the best option. In order to preserve your life bar and your healing items, you gotta work smart, not hard. Many enemies have weaknesses or exploitable animations. Those big undead samurai are covered head to toe in armor EXCEPT for their backs. Minotaur, though large and powerful, are very slow. Some also have immunities and strengths to be considered. Hecubites, those insect demons, can’t be knocked over with kicks. Soulstealers, the face balloons, can float around combat and steal all of the souls that will come from other recently slain demons. Keep all of these things in mind when walking into a room and accessing your priorities. At Magic Mirrors, you can save and enhance your weapons granted to you by your gauntlet and the elemental orbs you’ll find. You can also upgrade the orbs themselves, which will increase the power and size of your magical attacks. It’s wise to upgrade your magic first. Magic will be your strongest weapon against bosses or large groups of enemies, and killing things quickly is imperative. Maybe more importantly, upgrading your magic orbs will grant you access to doors that are locked, color coded by orb type, and numerated by level. Focusing on raising the levels of your orbs first will lessen the pain of running into a door you don’t have the orb level to pass without grinding first. If you do find yourself running into stretches where you have to grind for orb, enemies tend to respawn rapidly in almost every room. Just leave it and reenter, and chances are high that it will be full of bad guys to harvest again. Some places, like the Keep Courtyard, just seem to endlessly respawn monsters in real time. So if you need all the farm with none of the downtime, consider backtracking to it. After absorbing a bunch of souls you may find that your gauntlet will morph into a new form. It has three forms total, but the game never tells you what these forms do. They don’t do much, outside of look cool and let you absorb souls faster. Maybe the easiest thing to forget after awhile is that you have ranged weapons. These can be powerful tools to help overcome hordes of enemies, because they do A LOT of damage per shot. Bows are quick and can be fired relatively rapidly. The Matchlock does big damage, and has alternate ammo that works like a shotgun, hitting multiple enemies at once if you aim well. 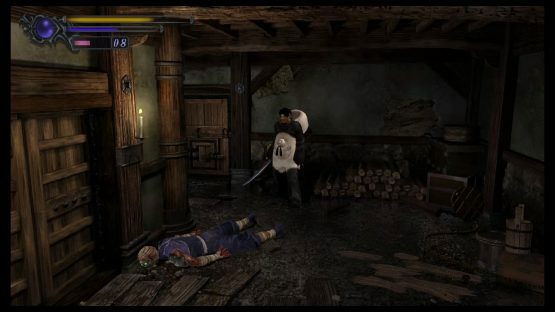 There will be a few opportunities during the course of the game to take control of Samanosuke’s sidekick, Kaede. She’s quicker than Sam, has a lot of quick firing projectiles, and can hop clear over monsters when evading. Ninjas are cool. But she is much weaker than Sam and has much less health. It won’t take much effort by any given demon to kill her. Resources are split between her and Sam, so any herbs you use keeping Kaede alive are ones you can’t use on Sam. To top it all off, she can’t absorb souls. This is all to say that when you are Kaede, you have absolutely no incentive to fight anything that isn’t directly in your way. Just run past everything you can, only stopping to engage the folks you absolutely can’t get around. 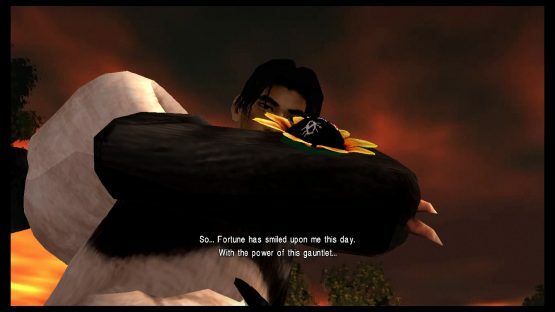 After you finish the first run through of Onimusha, you can unlock a new Panda costume for Samanosuke. I don’t have to explain why that’s awesome.